紧贴肺的表面，并随肺的裂隙而陷入。 Close to the lung surface, and with the crack and into the lungs. 按部位不同可分为四部。 According to the site can be divided into four. 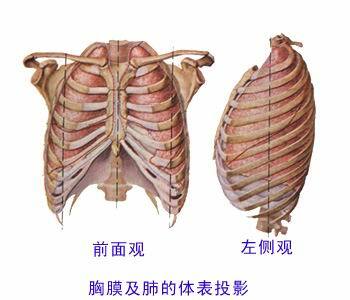 1)肋胸膜：衬覆于胸壁内面。 1) ribs pleura: lining the inner surface of the chest wall cladding. 2)膈胸膜：衬覆于膈的上方。 2) diaphragmatic pleura: lining to cover the top of the diaphragm. 3)纵隔胸：膜衬覆于纵隔两侧。 3) mediastinal chest: membrane lining both sides of the cover in the mediastinum. 4)胸膜顶：包在肺尖上方。 4) pleura top: package over the apex. 是脏、壁胸膜在肺根处相互移行构成的腔隙。 Is dirty, the walls in the lung pleura root cavities formed mutual migration. 左右各一，互不相通，密闭、潜在、负压。 So each one, refused to pass, closed, potential, negative. 有少量浆液起润滑作用。 A small amount of lubricant slurry. 是胸膜腔的最低点，位于肋胸膜和膈胸膜转折处，呈半环形。 Is the lowest point of the pleural cavity, located ribs pleura and diaphragmatic pleura turning point, was semi-circular. 胸膜腔积液时在此积存。 Pleural effusion in this accumulation. 纵隔是两侧纵隔胸膜之间所有组织和器官的总称。 Mediastinum is the general term for all tissues and organs between the sides of the mediastinal pleura. 1． 1. 上界：胸廓上口。 Upper bound: thoracic outlet. 2． 2. 下界：膈。 Lower bound: diaphragm. 3． 3. 前界：胸骨。 Former profession: the sternum. 4． 4. 后界：脊柱胸段。 After circles: thoracic spine. 5． 5. 两侧界：纵隔胸膜。 Both sides of the border: the mediastinal pleura. 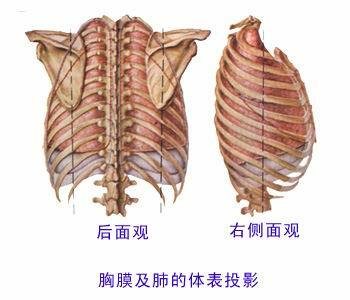 纵隔以胸骨角平面分为上、下纵隔。 Mediastinal sternal angle to the plane is divided into upper and lower mediastinum. 下纵隔又以心包为界分为前、中、后纵隔。 Mediastinal pericardium is again divided into anterior border, in the posterior mediastinum. 1． 1. 前纵隔：心包与胸骨之间。 Anterior mediastinum: between the pericardium and sternum. 2． 2. 中纵隔：心及大血管所在部位。 The mediastinum: heart and great vessels where the site. 3． 3. 后纵隔：心包与脊柱胸段之间。 Posterior mediastinum: between the pericardium and the thoracic spine. 主要结构有胸主动脉、胸导管、食管、奇静脉、迷走神经、主支气管、交感神经干等。 The main structure of the thoracic aorta, thoracic duct, esophagus, azygos vein, vagus nerve, the main bronchus, and other sympathetic trunk.